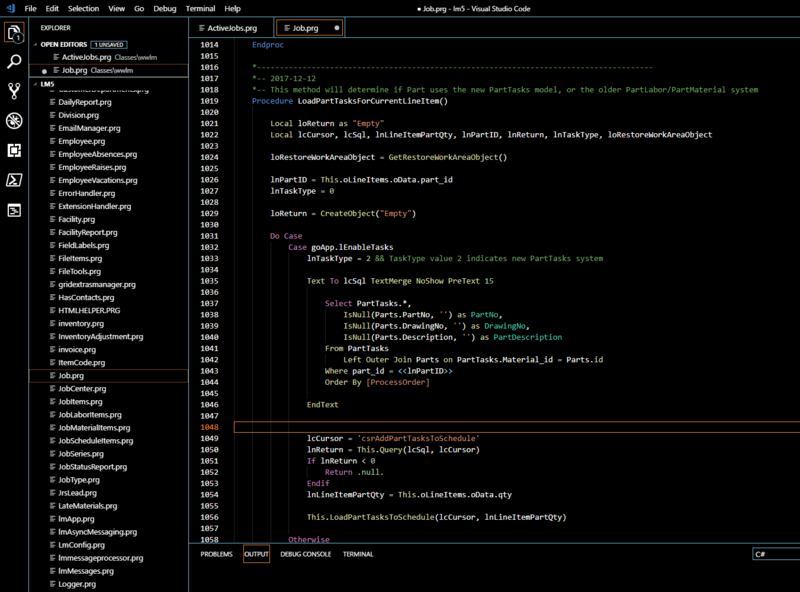 Get the FoxPro Syntax Highlighting extension for VS Code (Visual Studio Code). Just search for "FoxPro" in the Extensions panel inside VS Code. It's now in the Marketplace for easy install. This extensions also has several Snippets that generate code when you type a snippet keyword. Look in the "Snippets" folder and you can learn how it works, and it's really easy to add your owns snippet templates once you see the required pattern. FWIW – I use the VS Code FoxPro editor all the time – so much nicer writing code in there than in the crappy Fox editor ??. I’m glad it was added it to the Marketplace to make it easier to find and install – makes it easier for me to recommend. I’ll add that to the Web Connection documentation. Web Connection works pretty well these days with VS Code and in fact I use it for many of my sample projects these days. I publish VS Code Snippets with Web Connection that install in the local user store and they are pretty useful and relatively easy to set up. In fact I built a converter for Visual Studio (full) Code snippets to VS Code Code snippets that I used to take my existing Web Connection code snippets and port them to VS Code. Thanks Matt. I had noticed your name on it, actually.